Some miscellaneous photos of Denmark. 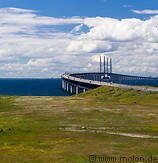 The Øresund (Öresund) bridge is a double-track railway and dual carriageway bridge-tunnel connecting Denmark with Sweden across the Øresund strait. As Denmark consists of a peninsula and several islands, bridges and ferries are used to to enable car and truck traffic and railway connections.